New Alternative Skin Care offers an initial consultation. It lasts a half an hour and involves a detailed assessment of your skin type and what type of skin care regiment that would be ideal to achieve the best possible results. This includes a variety of product samples customized for your particular skin type to test for a period of time to ensure that they are perfectly suited to for you. All the facials are individually customized and include treatment of the skin on the face and hands plus a relaxing face, hand and shoulder massage. In addition to standard facials, we offer deep pore treatments, glycolic skin peels and skin consultations to give clients the maximum benefits from their skin care regimen. Additionally, we will create customized essential oil blends to add to your skin care products to enhance your skin's overall health. Tightens and lifts by using electrical current to deliver herbs, vitamins and minerals to the skin. *Now carrying products formulated with pure grade MSM, and DMAE. The Galvanic Lift is done with custom designed pure grade MSM, DMAE, Co-Enzyme-Q-10, Liquid B'S made with pure plant and fruit extracts, and minerals, Aloe Vera, Lavender, Pure Rose, Jasmine Absolute, Frankincense, Rosewood and Geranium. It is quickly absorbed into the skin with Galvanic and makes the skin youthful and tight. Massage the face, shoulders and hands done with Pumpkin-E Oil base oil with rose, jasmine, lavender, etc. Great for all skin types, (non greasy). Soothes and heals, nourishes and revitalizes tired or stressed skin, and increases blood circulation. Benefits include soothing and toning, refining and polishing the skin. A mixture of Kaolin and Lactic Powder, Liquorish Root Extract, L-Malic Acid, Litartaric Acid and essential oils. This mask tones, uplifts, restores firmness, heals redness from extractions, soothes the complexion, improves facial contours, visibly improves the condition of irritated skin, sun damaged skin and mature skin. Shea Butter, Meadow Foam Oil, Squalene, Wine Extract, Vitamin E, Orange , Clove and Cinnamon Oil combined to add moisture and extra conditioning. Distilled water, Glycerin, Betonite, Kaolin, Witch Hazel, Cranberry Extract, Rosemary Essential Oils and Jasmine Alcohol. Heals and calms the skin. Teenagers can have problem skin with clogged pores and acne. New Alternative Skin Care deep cleaning facials and products promote smoother texture, more even tones, oil control relaxation. Teenage problems can persist into young adulthood. New Alternative Skin Care's deep pore cleansing treatment and products help to preserve youthful skin and promote relaxation. New alternative Skin Care's treatments and products help combat signs of aging and promote relaxation. 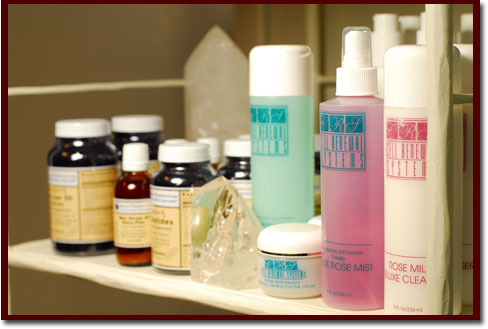 Rose Milk Cleanser: Sensitive, dry or mature skin. Hyda-Gel with AHAs Cleanser: All skin types. EGF (Epidermal Growth Factor): A duplication of a natural chemical usually present in healthy skin. EGF is skin food that actually feeds the cell. Protection 25 Moisturizer: Luxurious, light and soothing. Cellular Repair Serum: A cellular-rich fluid designed to restore hydration, tone and vitality while stimulating healthy new cell growth. jasmine, in an aloe vera, squalene sunflower oil base. Beta Moisturizer: Intensive vitamin A cream for dry skin. Aloe Rose Toner: Balances the pH of the skin. Lavandin Cleanser: Normal to oily skin. Herbal Wash 5%: Normal to oily skin. Retinolic Extra Strength Serum: Exfoliates and renews skin cells. C20 Serum: Texturizes and strengthens skin. Sage Citrus Moisturizer: A light moisturizer that helps to control excess oils and nourish the skin. Peach Wine Cream: Soothing and tightening moisturizer for combination to mature/dry skin. Roseate Eye Serum: Moisturizing and soothing oils of rose. Hazel and Hazel Toner: For combination to dry skin. Ginseng Toner: All skin types. I had acne and a poor complexion. Dermatologists and pills had worked fair to poorly. I considered taking Acutane until I read about the side effects. I like New Alternative's use of natural products and the professional and friendly demeanor of B.B. It took a year or two, but my skin improved until acne was no longer a problem. Today, 10 years later, I still go in four times a year and my skin is very healthy. New Alternative really was the key to treating my acne and improving my complexion. I always look forward to my monthly facial sessions with B.B. It is always very relaxing and rejuvenating. B.B. 's skin care is so much more than just an ordinary facial. Time with B.B. is more like a spirit filled experience. She reminds me of a magical healer. Not only does she know all the ‘folk-lore' about the healing of natural plants, but she imparts their essence with a touch that nurtures all the senses as well as the soul. My favorite thing about B.B. 's facials is that she creates and designs your facial to fit what your skin needs at that moment. I've been getting facials from B.B. since I was in my mid-twenties. I had cystic acne, tons of blackheads and a terrible fear that even if my skin cleared I would still have horrible scars. Now, in my early thirties, I have beautiful skin – something I never thought I'd be able to say. I rarely have breakouts and my scars are all but invisible. B.B. has helped me so much, and she's done so with naturally derived products and a great deal of compassion. I am lucky to have inherited great skin, but about three years ago I noticed it was really beginning to show some wear and tear. Regular facials with B.B. and commitment to daily use of the products she recommends has resulted in a rapid and dramatic improvement! Today I look in the mirror and feel Satisfied I am holding my own against Father Time.